As I noted last month, I love Leopard’sQuick Look feature, which lets you get an instant preview of a file by selecting the file and pressing the space bar. However, in order for this feature to work for a particular file, Quick Look must support that file type. A growing number of plug-ins are available. I’ve already covered BetterZip Quick Look Generator, which lets you peek inside zip and other compressed-file archives using Quick Look. Today I’m going to talk about a few other favorites. If you’ve ever tried to use Quick Look on a folder, you may have been surprised to find that it shows only a large folder icon, the name of the folder, and the date and time the folder was last modified—less information than that provided by list, column, and Cover Flow views in the Finder. XDD’s Folder Quick Look Plugin ( ; free) lets Quick Look work its magic on folders by giving you a list-view-like display of a folder’s contents, as well as detailed information about the folder as a whole (the number of top-level items in the folder, the full path to the folder, and the folder's creation and modification dates) and about each item in the folder (creation and modification date, size, and kind). Hover the mouse cursor over an item to view the full path to that item. You can choose, via checkboxes in the Quick Look window, to view the creation and modification times for each file, as well as any invisible files contained in the folder. In addition, technically-inclined users can modify many other display options using instructions included in the plug-in’s documentation. One limitation is that you can’t double-click on an item in the Quick Look display to open it. The extent of interactivity you get is a small arrow that appears when you move the mouse cursor over an item; click the arrow to view the item in the Finder. Sure, it’s nearly as easy to actually open a folder, but if, like me, you’ve integrated Quick Look into your normal workflow, this plug-in provides a convenient way to explore a folder’s contents. Also from XDD, the flv Quick Look Plugin ( ; free) empowers Quick Look to let you preview Flash media files; for example, if you used the TechCrunch YouTube Video Download Tool to download some movies you saw on YouTube, but now you can’t figure out which .flv file is which. Using Quick Look on an flv file displays a small video-viewing window, much like the one you’d see for a QuickTime movie. Clicking the Play button lets you watch the video, and you can drag the progress nub (or scroll with your mouse or trackpad) to scrub through the video. Unfortunately, flv Quick Look Plugin currently supports only .flv Flash files; Quick Look still won’t be able to preview .swf files. The plug-in requires the Perian add-on for QuickTime, which I covered previously. Pacifist is one of my favorite Mac OS X utilities. 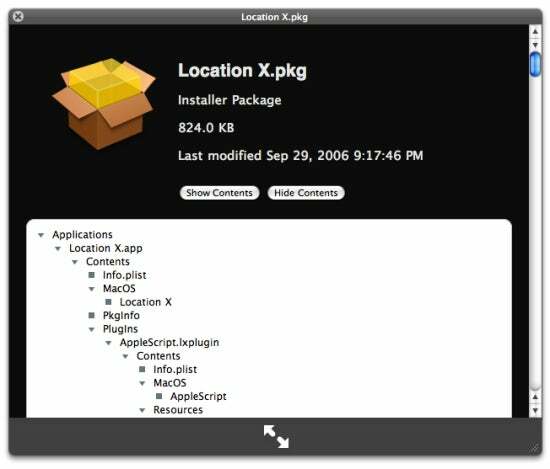 Although it has a slew of useful features, one of the most popular is its ability to let you inspect a Mac OS X Installer package to see what will be installed, and where. Mothers Ruin Software’s Suspicious Package ( ; free) gives you this particular bit of functionality from within Quick Look. Just select an Installer package and press the space bar, and you’ll see a preview of the package’s contents; click on the Show Contents button to view a hierarchical list of all files to be installed. By design, Suspicious Package works only on Installer package files; it won’t inspect third-party installers. In addition, the current version of the plug-in does have some limitations. For example, only packages ending in .pkg can be previewed; support for .mpkg packages is in the works. And with some packages, the file listing doesn’t show where each file will be installed; more details on the reasons behind these limitations can be found in the Suspicious Package FAQ. For more Quick Look plug-ins, check out QLPlugins.com. The Quick Look plug-ins covered above require Mac OS X 10.5 or later.